The Honolulu Museum of Art’s Stephen Salel, left, leads a panel discussion with artists Audra Furuichi, Jamie Lynn Lano and Brady Evans; Kawaii Kon senior administrator Roy Bann; and some dorky blogger boy who probably should’ve moved his chair closer so he could see better. Photo by Diane Masaki. 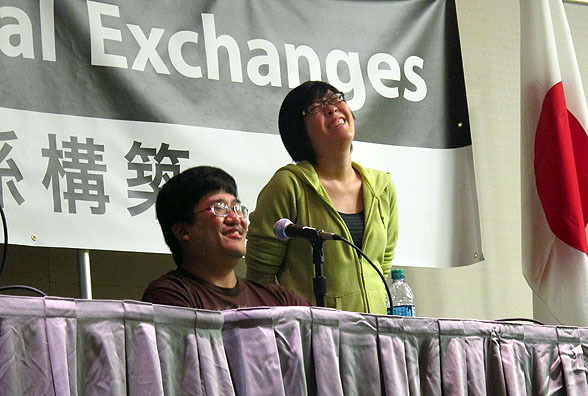 On Oct. 7, your friendly neighborhood otaku blogger joined artists Brady Evans, Audra Furuichi and Jamie Lynn Lano, as well as Kawaii Kon senior administrator Roy “Buma” Bann, for “Manga in Japan, Hawai‘i, and Throughout the World,” a series of short lectures and a roundtable discussion at the Honolulu Museum of Art. Hosted by Stephen Salel, the museum’s Japanese art curator, the event was held in conjunction with the ongoing exhibit “Visions of Gothic Angels: Japanese Manga by Takaya Miou,” on display through Jan. 15. A handful of people showed up. Some weren’t even friends or spouses of the speakers! 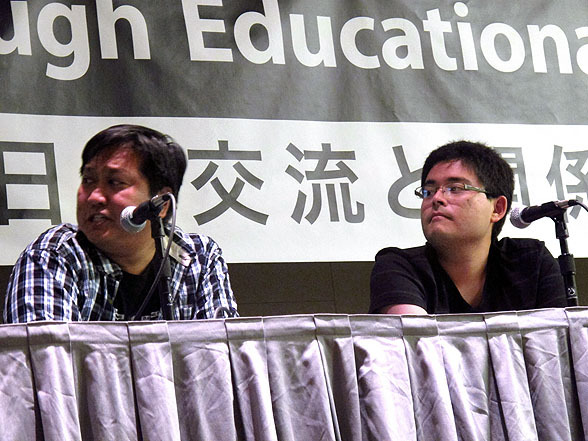 And whoever was there learned a fair amount about manga and our perspectives on the industry. (As far as I could tell, no one fell asleep during the presentations, which was also a big plus.) Thanks to everyone who turned out! But maybe 4 p.m. on a Friday didn’t really fit into your schedule. It’s OK; we have you covered. I’m pleased to announce that about 90 percent of the day’s presentations have now been posted on YouTube. Sadly, Stephen told me this morning that the other 10 percent — that closing discussion, a picture of which is shown above — isn’t available due to some serious audio problems. My presentation predominantly features my slides, which is probably a good thing, considering I was kinda squinting and tearing up during a good chunk of it. (It was probably a combination of nerves and some wayward dust particles.) The videos are conveniently broken up by speaker. 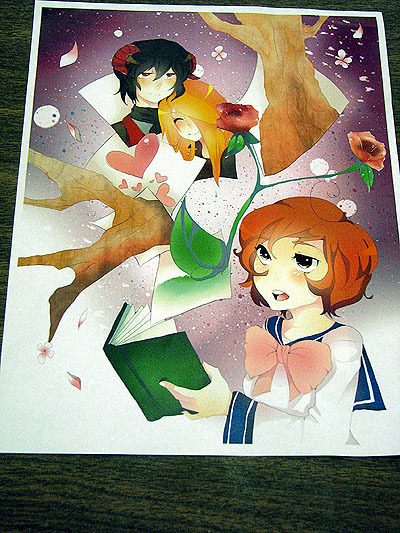 Part 5: “Rise, Fall, and Rebirth of the Manga Industry in the U.S.” by me! 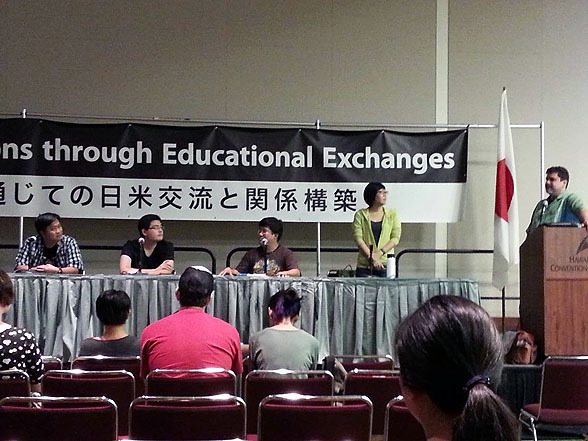 Good news, everyone: The “Made in Japan, Loved in Hawaii” panel, which I talked about in my last post, went off without a hitch. Roy Bann, Brady Evans, Audra Furuichi, Jon Murakami and I talked about anime and tokusatsu series for a little over two hours, more people were sitting in the audience than were on the panel, and I didn’t die of embarrassment afterward. Victories all around! Thank you to all of you who came to visit, even if you stayed for just a little while. 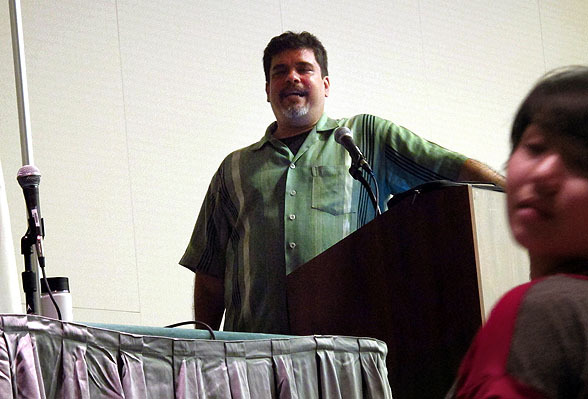 … and Roy, who served as panel moderator. 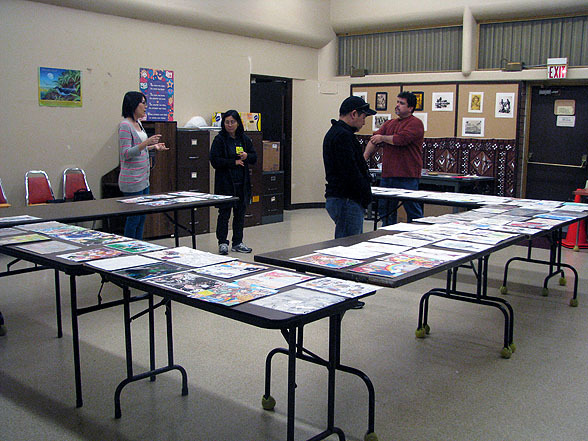 Here’s a full shot of the panel table taken by cartoonist Roy Chang. 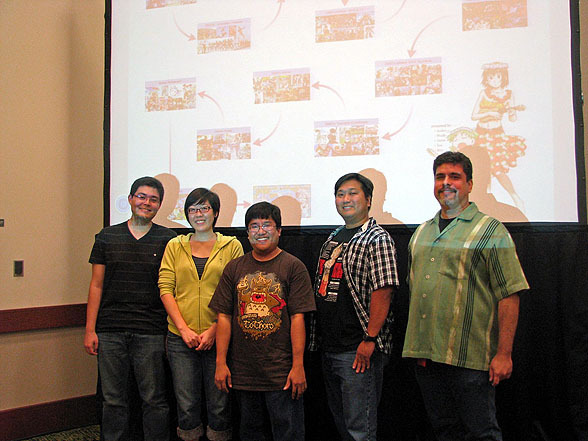 And here’s a shot of all five of us after the panel, taken using the official Otaku Ohana Camera of Record by McCully/Moiliili Library branch manager Hillary Chang. That’s her in the black shirt in the front row. The world around you is not what it seems. It’s happening all around you. They aren’t coming. They’re already here. Our future is at stake. And you must choose a side. A mysterious energy has been unearthed by a team of scientists in Europe. The origin and purpose of this force is unknown, but some researchers believe it is influencing the way we think. We must control it or it will control us. Find out what it’s all about during Teen Tech Week! 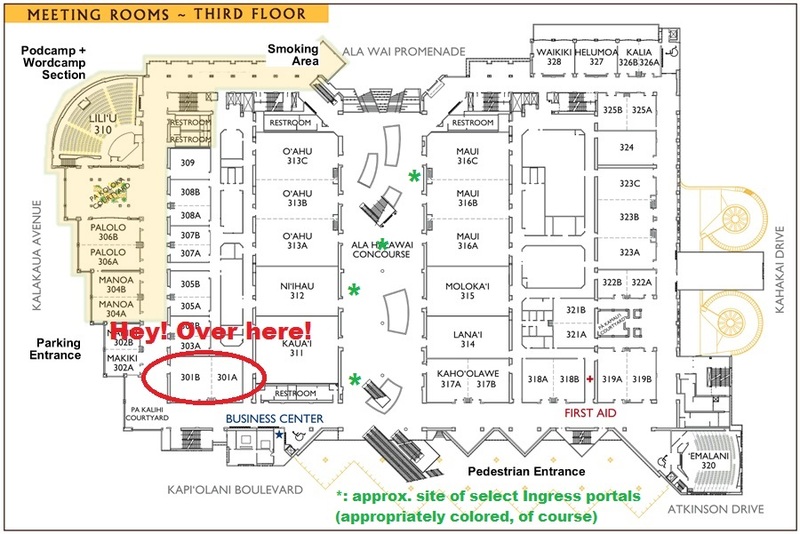 Also significant: It’s the last public program at the current library location (99-143 Moanalua Road) before they pull up stakes and head to their new building on the site of the former Aiea Sugar Mill. 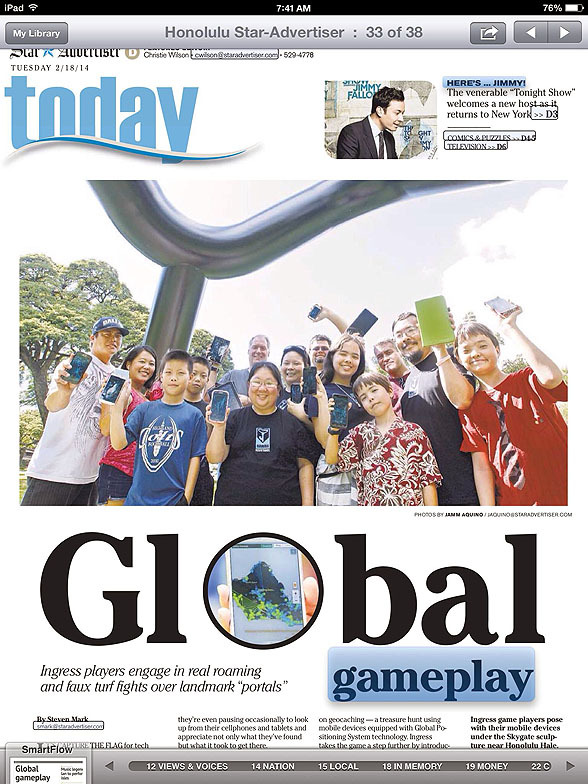 So if you’ve ever been curious about the game or some of those Ingress-related jokes that I’ve increasingly been including in this blog, come on out. We’d love to see you. 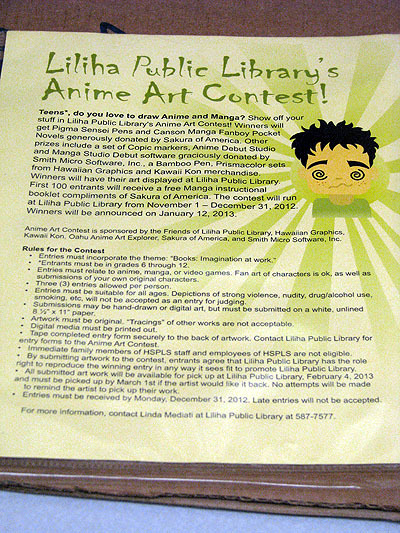 Last Thursday, when nemu*nemu artist Audra Furuichi, Kawaii Kon senior administrator Roy Bann and I were looking at the entries for the 2012 Liliha Library Anime Art Contest, young adult librarian Linda Mediati, let us know that … well … that was it. 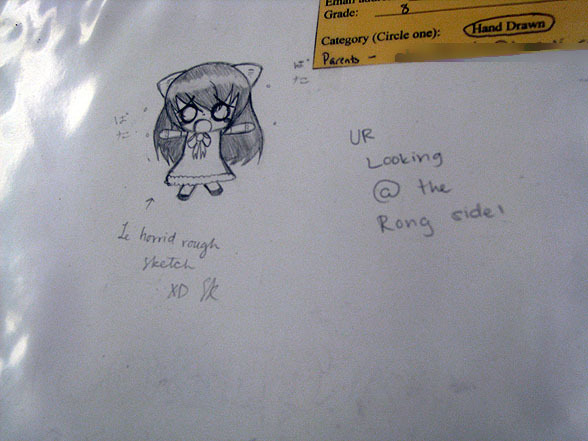 After this third go-round of getting to evaluate some of the best anime-inspired student art in the state (well, okay, mostly on Oahu, with a few glorious exceptions), our services would no longer be needed. This edition of the contest would be its swan song. “Well, it was a good run,” Audra said. Indeed, it was. Sure, the number of entries received was down from previous years — 55 total. But at least it was much better than the number I had heard when I posted my appeal for more entries a few weeks ago — 12. Thus, while the tables weren’t completely covered in entries as in the past, it still looked pretty darned impressive. It took 2-1/2 hours for us to choose what ended up being 13 winners. Once again, the quality of entries made it difficult for us to pick. This post, in fact, highlights all the entries that didn’t win, yet still deserve to be seen. But before we get to the by-now-standard Flickr photo gallery, I should mention that this year’s contest ended up being a bit more … personal for me. It’s because of this picture. It was a bit personal for all of us, really. 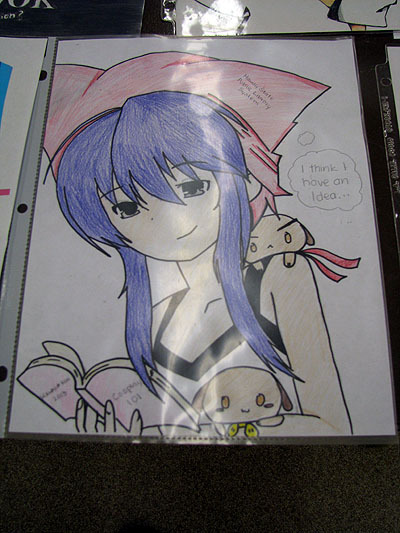 I believe the exact words spoken were, “Look, they’re trying to butter us up!” Indeed, that picture was the only one out of all the entries to prominently feature Audra’s creations, plush pups Anpan and Nemu. So as I had all afternoon, I dutifully troddled over to take a picture, then flipped it over to record the name and grade of the artist. 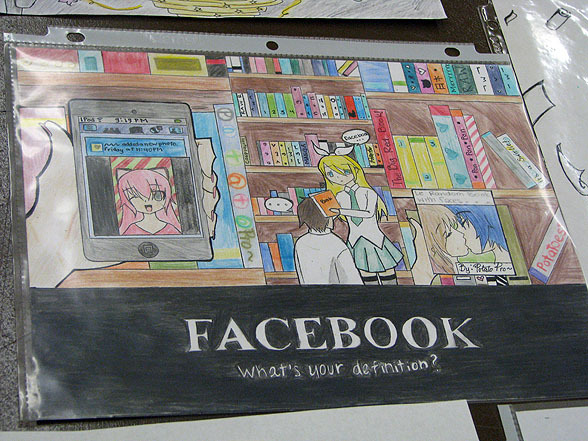 That picture was done by eighth grader Sieri Kuranishi. Sieri loves drawing, lovebirds, her black yowling scratchy kitty, Choco Babies candy, Vocaloids and playing Hatsune Miku: Project Diva F on the PlayStation Vita. And I know all of these intricate details about her because I’m her cousin. But I couldn’t help but notice that this was on the back as well. But enough of my rambling; let’s get to the other highlights from the non-winning entries in this year’s contest, presented in handy Flickr gallery form. 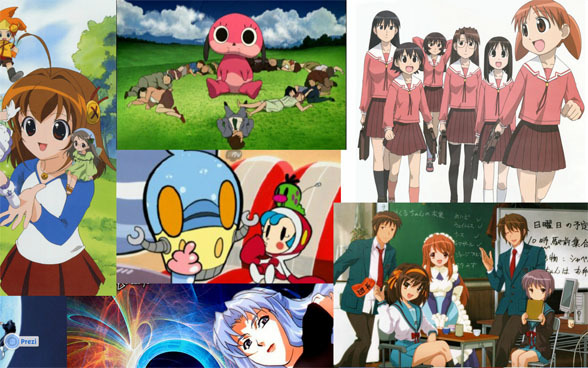 Next time in Otaku Ohana: The winners! 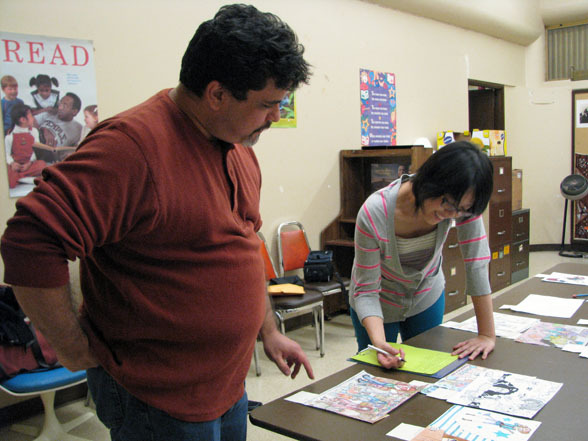 Also, a reminder: If you want to come meet the winners and see their winning entries in person, stop by Liliha Library, 1515 Liliha St., at 10:30 a.m. Saturday. We’ll be there handing out the prizes, too!